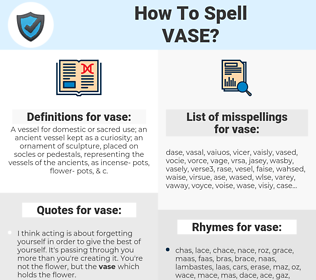 What are the misspellings for vase? What are the common mistypes for vase? 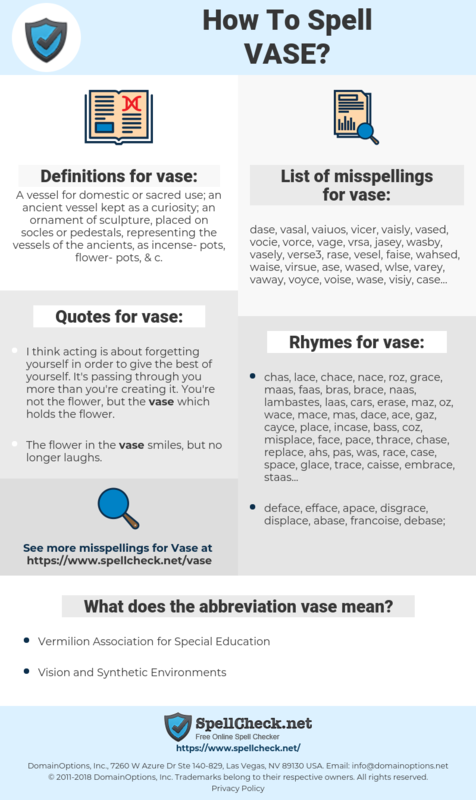 What is the definition of vase? What does the abbreviation vase mean? What are the quotes for vase? What are the rhymes for vase? What are the translations for vase? What are the common typos for vase? A vessel for domestic or sacred use; an ancient vessel kept as a curiosity; an ornament of sculpture, placed on socles or pedestals, representing the vessels of the ancients, as incense-pots, flower-pots, &c.
This graph shows how "vase" have occurred between 1800 and 2008 in a corpus of English books. 花入, 花入れ, 花生け, 宝瓶, はないけ, ぐんじ, 軍持, 花立て, はなたて, はないれ, ほうびょう, 花瓶. vaso, vasija, jarra, florero, jarrón.